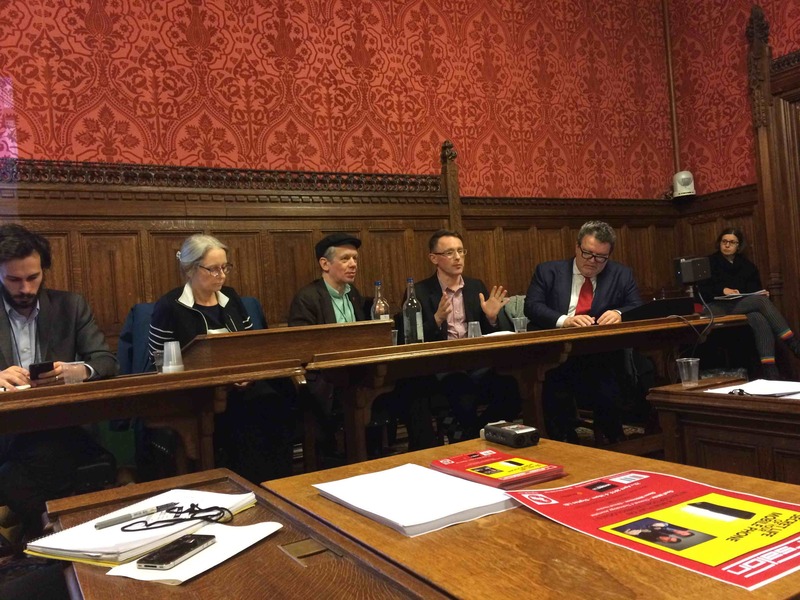 Background; Last night (March 23rd) Cybersalon, co-ordinated by Eva Pascoe, organised one of their public events in the House of Commons discussing Digital Citizenship. This was in response to being invited to comment on 3 new government policy documents relating to the developing and evolving digital world we increasingly live in. First of all The House of Lords Digital Skills Committee report Make or Break The UK’s Digital Future (pdf). Secondly the Speakers Commisson (John Bercow) on Digital Democracy and, as it turned out, most importantly for the debate the recent report on digital surveillance Privacy and Security: A modern and transparent legal framework (pdf) by the Intelligence and Security Committee. 1. Being involved in the longest occupation of a UK University, actually Northern Polytechnic in London, for 5 months in 1971; we also occupied the Canteen for 5 years and ran it as a student co-op. 3. Teaching the Social Impact of Computing and developing my own model of technology-driven social change; NSU, networks, services, users. Overview; This is my fifth in a sequence of six reflective blog posts on how I developed my teaching and learning practice and reflects on my practice in the noughties. I spent time running workshops in England, Scotland, Wales and Northern Ireland in Community Learning, become a Visioneer with Culture Online in 2001, an early attempt to create a digital public space. The DfES asks to me develop a ‘Digital Divide Content Strategy’ and we started the Metadata for Community Content project looking at modelling informal e-learning. I also start work on the Cybrarian project, a Facebook for e-learning that had a working prototype social network, built by Fujitsu before Zuckerburg started his “Hot or Not” coding. It was rejected on the advice of management consultants (who charged £4.5m for that deathless advice), we form lastfridaymob (a pubic technology group), which later reconfigures as the Learner-Generated Contexts Research Group. We present the Open Context Model of Learning at the launch of Open Learn; John Seeley Brown call it the ‘most exciting thing happening in England’. The OU refused to publish it. Overview; This is my fourth in a sequence of six reflective blog posts on how I developed my teaching and learning practice and reflects on my practice in the 1990s. I become aware of the Internet in the 1980s and discussed its social impact before incorporating it into course design. I looked at the technical architecture of the net and the Web and started to developed early courses for the Internet and the web, including the MirandaWeb award-winning TaLENT Community Grid for Learning project in Lewisham; Teaching and LEarning with Educational NeTworks. I look at how this new learning design required new learning literacies. Overview; This third reflective blog post on my learning and teaching is about how I developed my professionalism as a teacher in the After Math of beginning to teach computing in a UK college instead of politics in a USA University; it’s how the light gets in. I think I eventually developed a craft of teaching which, as Malcolm Gladwell and Richard Sennett argue, takes 10,000 hours. Overview; This is my second reflective post (the first was on learning) and is quite complicated because I was the alternative education officer in a Student’s Union when I was 19 then, when I was 28, had an offer to be a teaching assistant in the USA where I started teaching Politics, then when I was back in the UK, had a very significant phone call asking me to teach Computing. Resolving those differences lead me to become a good teacher IMHO, the significant aspects of which I will pick up tomorrow. Overview; This is my opening blog post for the MOOC First Steps in Teaching and Learning and we have been asked to reflect on our practice as learners and teachers. I will cover 4 points, my learning experience, my initial teaching, my practice after understanding teaching (brokering learning) and my open context based practice in a post-Web 2.0 world. Having commenced this process with this blog post I have now decided to do this as 4 daily blog posts; this is part 1.